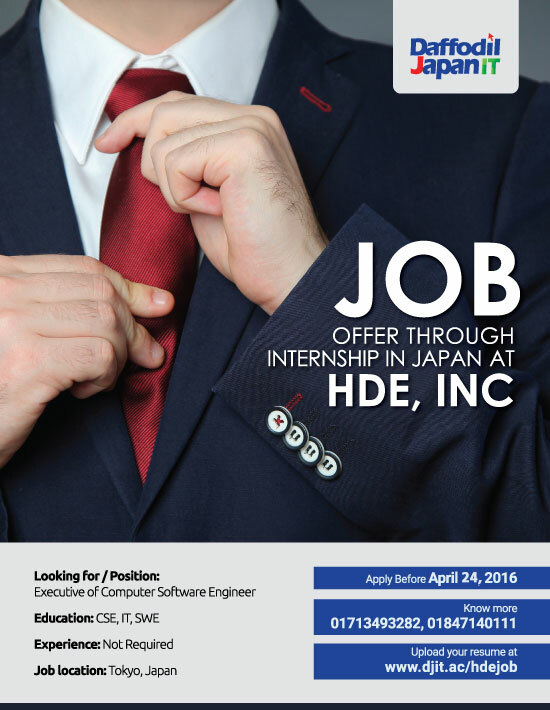 Job offer through internship in Japan at HDE, Inc. The Company named HDE, Inc. was established in 1996, Head office: Tokyo, Japan. HDE is exceptional IT Company in Japan who can develop the unique program in Japan”. CSE, IT, SWE Graduates from reputed University. 2 months internship in Japan (no salary but all cost will be paid by company) After confirmation 2,30,000 per month and others benefit as per company policy. Online Resume Submission deadline on 24th April, 2016 (Sunday). Online Coding Test: Date notified by email later. Candidates have to submit their updated resume with all project details.